President of the Republic of Azerbaijan Ilham Aliyev and his spouse Mehriban Aliyeva have viewed BakuTel-2016, the 22nd Azerbaijan International Exhibition and Conference on Telecommunications and Information Technologies. Azerbaijan`s Minister of Communications and High Technologies Ramin Guluzade informed the head of state and his wife about the exhibition. The exhibition brings together 200 companies from 18 countries. Nine countries, including Austria, Belarus, Iran, Italy, France, the Kingdom of Netherlands, Slovenia, Turkey and Croatia apart from the national stands of their countries' leading companies showcase innovative projects both for Azerbaijan and the entire Caspian region, as well as the products and services in the field of ICT. 40% of participants are regular exhibitors. The leading ICT companies, Azerbaijani mobile operators, communications operators, internet providers, system integrators, and distributors of well-known brands are among the exhibitors. 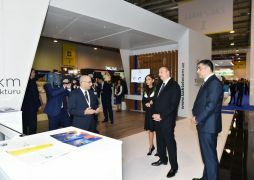 The exhibition features national stands from a number of countries, supported by the Ministry of Communications and High Technologies of the Republic of Azerbaijan. New projects carried out in communications, postal and e-government fields are displayed in the Ministry's pavilion. Bakutel exhibition, one of the largest events in the region, has been bringing together leading players of the communications market over 20 years. The support from international industry institutions such as the International Telecommunication Union (ITU), and accreditation from UFI, the Global Association of the Exhibition Industry attests to Bakutel's international recognition. The four-day exhibition will feature presentation of projects as "Audio library for visually impaired children", "Google Art Project"and "Digitalization of museums", as well as a number of conferences and forums will be held on the sidelines of the event. President Ilham Aliyev and his wife Mehriban Aliyeva viewed the pavilions of the exhibition.